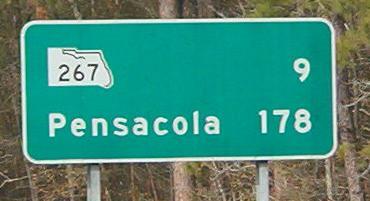 Westbound north of Pensacola, first photo courtesy J.P. Nasiatka and second photo taken in 1984 by Michael Summa. I definitely prefer the old style. First of all, the exits haven't moved, so 1/5 is accurate, but I do agree with making the distance 1/4 mile for consistency. I disagree strongly with shoehorning Pensacola Blvd. in there - US 29 should be plenty enough to sign the exit. 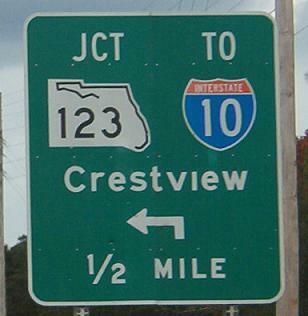 That would let modern-day FDOT write full-size directions in there just like on the old signs. FL 85 NB into Eglin Air Force Base courtesy Costa Ioannidis; the main entrance is on FL 397, which continues straight ahead in the first photo. 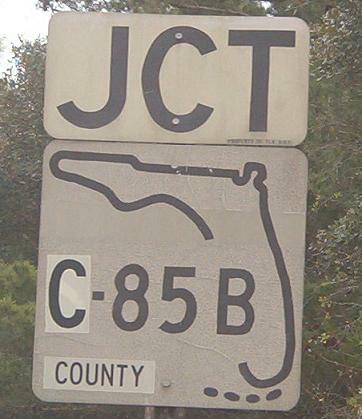 FL 397 is divided by the base, but Eglin Blvd. ties the two ends together. Because the base begins right here (85 cuts through it but 397 actually enters it), this piece of FL 397 is very short and ends immediately at FL 189. That's why 397 isn't signed here. In addition to the old cutouts on FL 85, there's a goodie by continuing onto FL 397 (before it even gets a chance to end). That JCT is property of FLA D.O.T., so watch out. 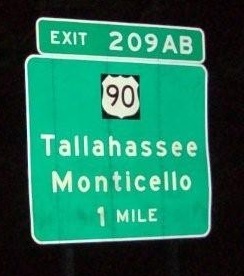 Although FL 85 is the route from down here to I-10 across the base, FL 123 cuts the corner known as Niceville, and is thus a shortcut to the Interstate. 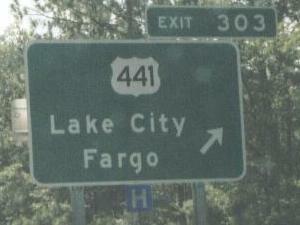 Westbound in Lake City and then further west of there. First photo taken in 1974 by Michael Summa, second photo is modern and courtesy Costa Ioannidis. NJ-style between those two distance signs, courtesy J.P. Nasiatka. I prefer a hyphen between A and B so that you can tell there are separate exits and not a grotesque hybrid, half-exit half-dragon with the mane of a horse and the bark of a cherry tree. Another crop of kindergarten flunkies got hired, eh? Is it that hard to line two objects up? Yes, when there's a seasonal flip-up sign (for the Olustee Battle Festival) on the back taking up the rest of the space. Eastbound, courtesy J.P. Nasiatka, and thanks to Sean P. McCool (if that's your real name) for the info. One more Costa Ioannidis photo, an old westbound overhead assembly in Jacksonville. Roosevelt Expwy. breaks off to the left and becomes Roosevelt Blvd. when US 17 joins it.